A Bird Hunter's Thoughts: How do they do it? After we got back from the mountain excursion and ate some quail and sharptail, I stopped by an old honey hole near the reservoir. About an hour before dark. Right out of the truck, Bandit pointed and the quail got up and flew to private land. I got the dogs back and moved a little further in the area. As I walked by a shrub downwind of the dogs and me, the whole bush exploded! Must've been 25 birds in this covey. And they flew over a small tree line and set down! Very cool. We combed that area for 20 min and didn't get anything but a point where they landed. 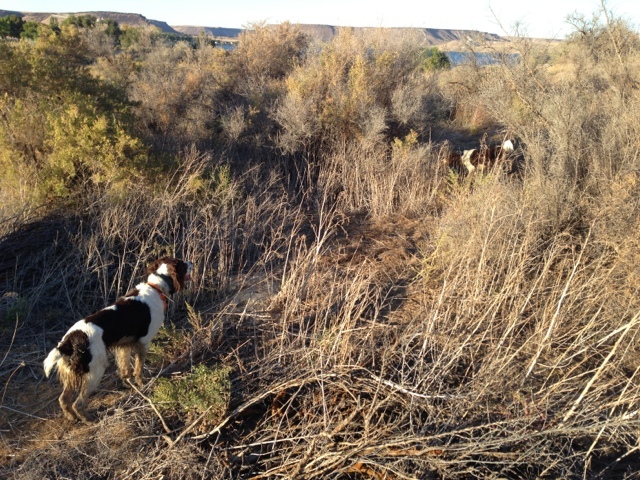 Off to another part of the area and Bandit had another covey. But, this one was in cover so thick, I could only hear the flush! Probably 40 quail on the area and we walked away with nothing!! !